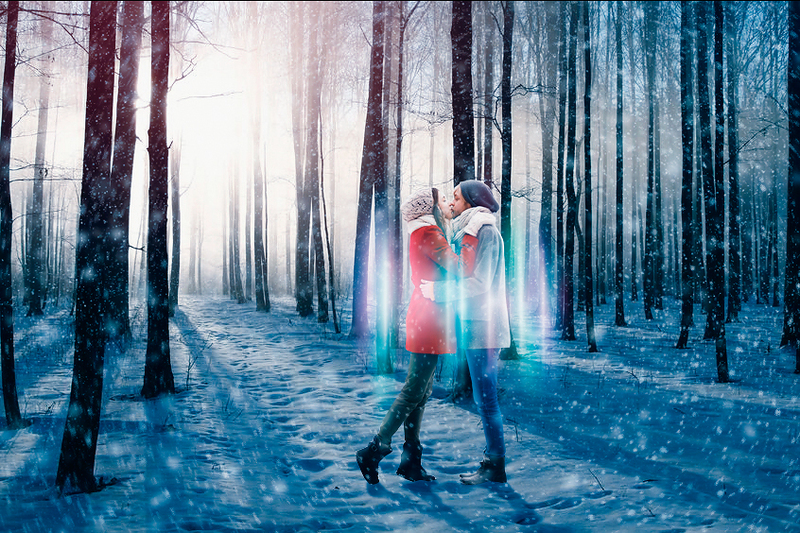 In this tutorial, I’ll show you how to create a snowy atmosphere with an aura effect. In addition, you’ll also learn how to color-correct using adjustment layers, and add movement using the Radial Blur filter. First, extract and position your main elements. In this tutorial, I chose this image of a young couple in a winter embrace. There are multiple ways to extract a photo but personally, I prefer using the pen tool. 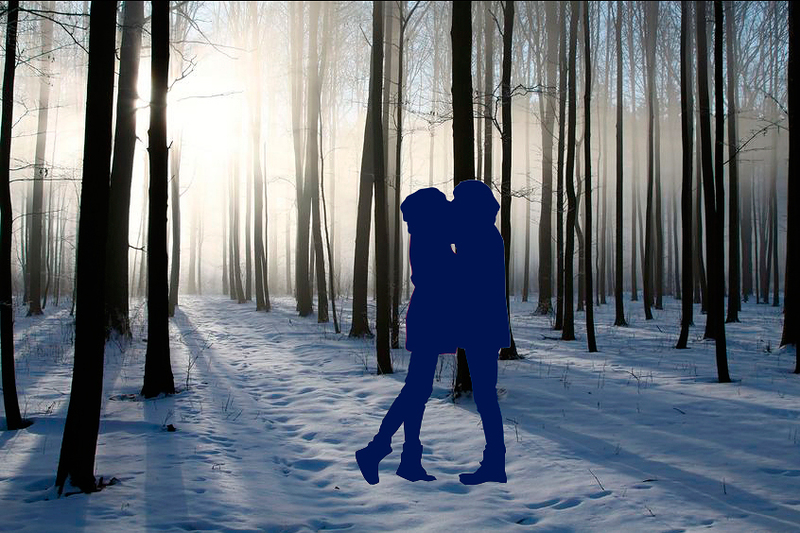 Next, we’re going to add a shadow to the couple. 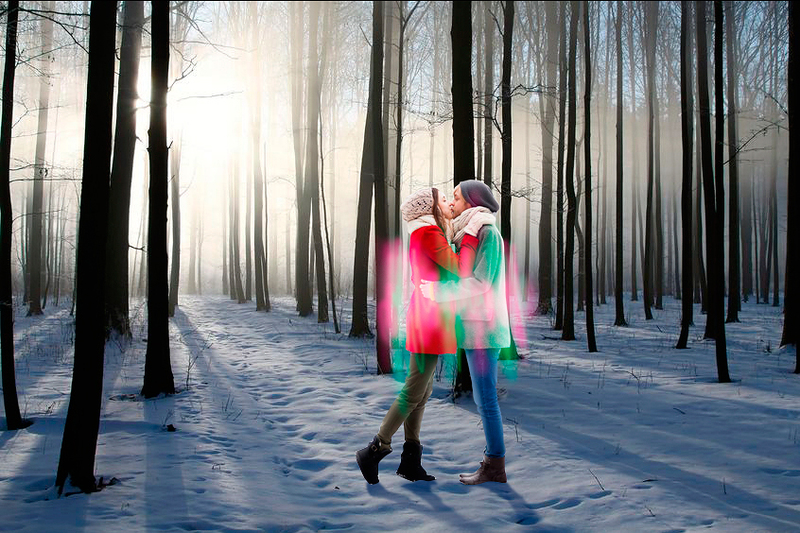 Duplicate the couple’s image and add a “Color Overlay” layer style. Set color to #11204f and right click > Rasterize Layer Style. 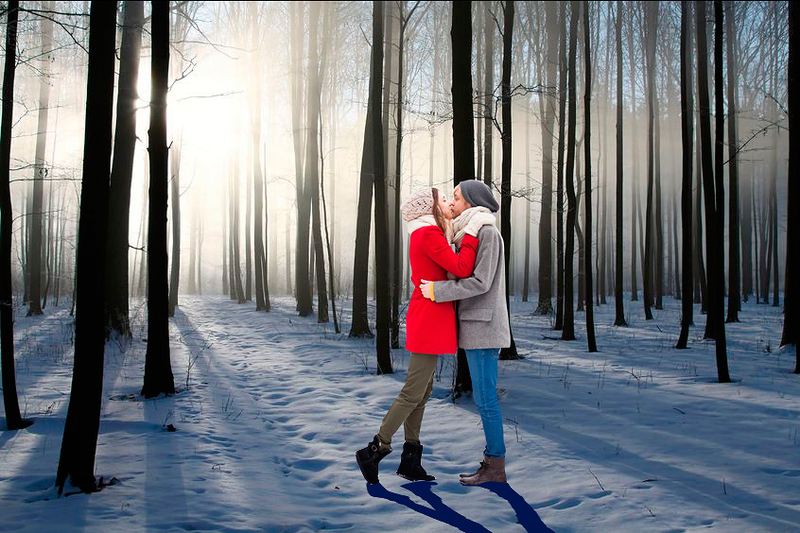 Rename the layer as “Shadow” and move it behind the couple’s image. Using the Move and Transform tools, pull the shadow layer down so it appears almost upside, but slightly squashed. Click on Transform Control then right click > Perspective. Grab the bottom, “Transform Control” and pull it to the right to slant the shadow. Next, drag the Opacity down to 70%. Blur the end of the shadow furthest from the couple. You can do this with any of the blur filters. I used the “Tilt-Shift” filter that is only available in Photoshop CS6 and CC. 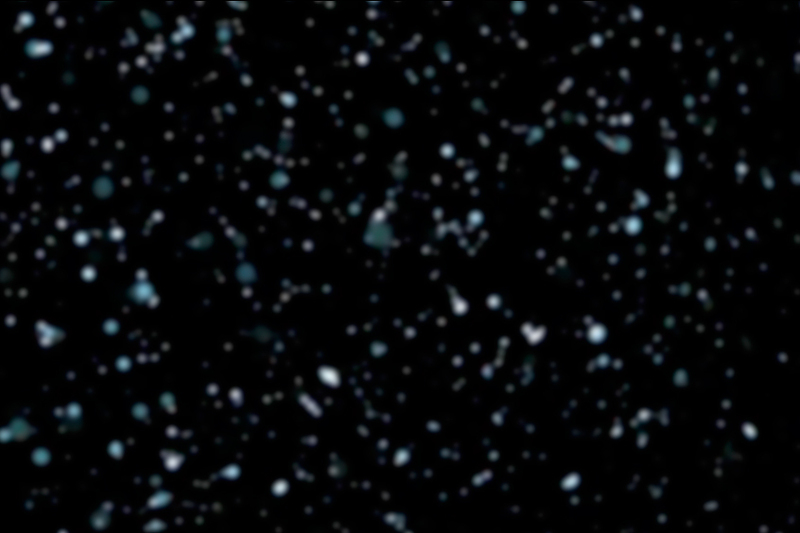 Other than that, Gaussian Blur would be another good option as well. Take note that you only want to blur the ends, not the feet. 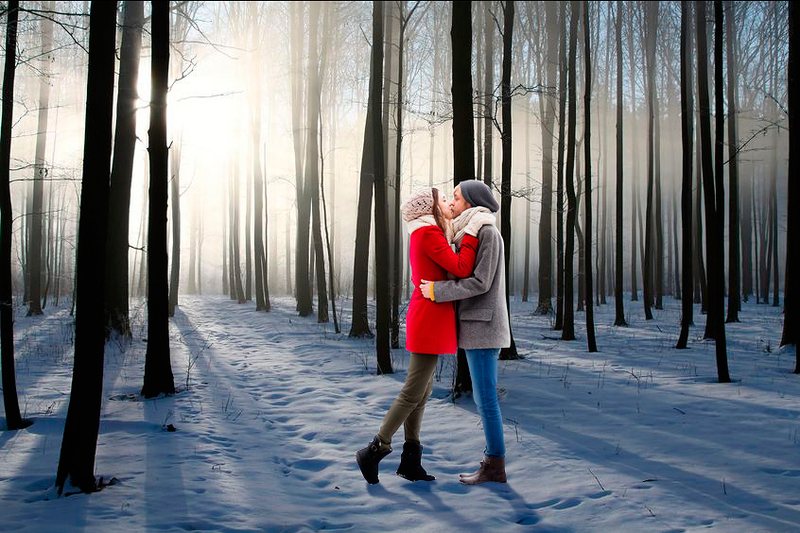 Now, we’re going to add some lighting to the couple to match the forest. First, we’ll do the shading. Since the couple is being lit from behind, the side facing us will be darker. Create a new layer and attach it to the couple. Set it to “Soft Light”. With a soft round brush set to Black and about 30% opacity, start painting the couple but be careful to stay away from the edges. Create a new layer below that layer and set it to “Soft Light” as well. With the same brush, only this time set to white, paint around the edges of the couple. Now, we’re going to add an aura effect around the couple. To start, create a new layer above the couple and set it to “Screen”. Create a new layer above that layer and do the same thing, only this time with a hot pink color. And do it one more time with a light blue color. Select and merge those three layers together and set them back to “Screen”. Go to Filter > Blur > Motion Blur and vertically (using up and down movement), blur the layer until it looks smooth and rename the layer “Aura”. Note: You may want to enlarge and shape it a bit as well. Create a new layer above your aura layer, and set it to “Overlay”. Now, do like you did before with the pink, green and blue shades, only this time with the color white to make the aura seem brighter and more solid. Do it one more time with thinner lines, like you see below. Now, we’re going to add snow. Next, go to Filter > Blur > Radial Blur and set it to “Radial” and “Best”. The amount is up to you depending on the size of your image, so just trial and error until the image is to your satisfaction. 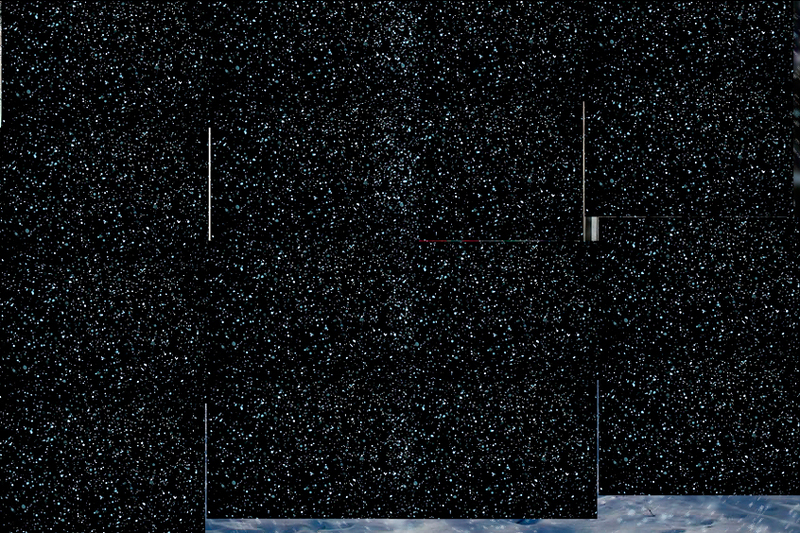 When you’re done, duplicate the snow image and enlarge it. 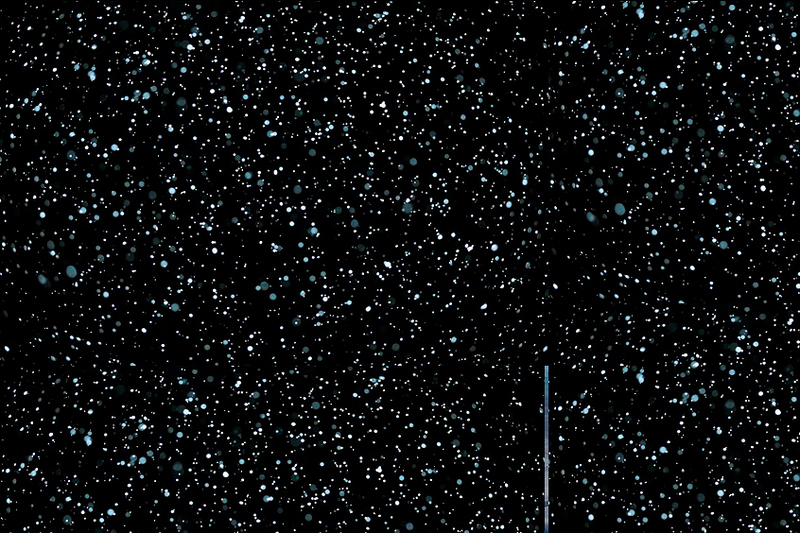 Finally, duplicate the original snow layer and shrink it. Merge these layers together and place them directly above your background layer at the bottom. Now, we’re going to do some color correcting using adjustment layers. Above all your other layers, create a “Color Balance” adjustment layer and set it to Red -38, Green, -14, and Blue +15. Create a new layer above that and set it to “Screen”. With a very large soft round brush, paint a hot pink color on the upper part of the sky near the light source and set the layer opacity to 29%. Above that, create a “Color Lookup” adjustment layer, and set it to “Abstract” “Sienna-Blue”. Finally, below your aura layers but above the layer of the couple, create a “Brightness and Contrast” adjustment layer and set it to Brightness -10 and Contrast +31. Note: You may want to lower the opacity of your snow layers. Next, we want to add some colored light from the aura to the snow below the couple, and also on the couple themselves. Attach a new layer to the couple, and set it to “Screen”. Set a medium soft round brush with a mixture of the same colors you used for the aura paint on the couple. Create a new layer above the couple layer, but do not attach, set it to “Overlay”. Again, with the same brush and the same blue, pink and green color, paint in some light below the couple on the snow. Let The Merry Winter Holidays Begin!